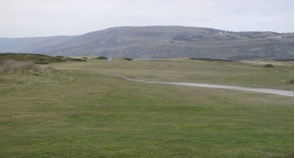 The North Wales Golf Club was founded in 1894 by a prominent Manchester Businessman Tancred D. Cummins. Mr. Cummins invited Mr. John Ball, first Englishman to win the Open and winner of numerous Amateur Championships, and Mr. Harold Hilton, twice Open Champion, to assist in the course layout. 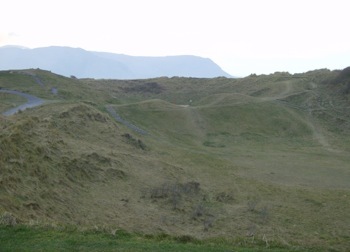 North Wales sits on pristine links land with many large dunes. Llandudno is a fabulous Victorian Resort town, second only to Southport England as the prime seaside resort for vacationing English families. The course plays 6,253 yards from the Championship tees and 5,893 from the member tees with a par of 71. The first shot in any round is always a nervy one and here you open with a blind dogleg requiring a tee shot of 200 yards to clear the houses that make up the inside of the dogleg aiming at the marker post in the distance. The second shot is blind to a small green with several traps. A slight dogleg left with the hole demanding a tee shot to land just short of the fairway cross bunker. The green is guarded by several bunkers. This down hill, down wind hole has a ditch crossing the fairway 250 yards from the tee that creates a risk/reward decision. The flat, large green is protected by several bunkers. This long Par 3 is played next to the commuter rail line so out of bounds runs along the left side of the hole with a prevailing right to left wind adding to the excitement. Two bunkers protect the right side of the green. At first glance this is a straightforward dogleg left par 5 hole as it stretches out in front of you. The hole climbs uphill at the corner of the dogleg all the way to the green, with the approach playing into the prevailing wind. 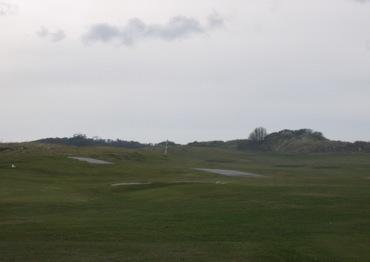 The large green is protected on three sides by dunes and bunkers. This hole plays down wind and slightly downhill back towards the rail line. A straight forward hole that is a birdie opportunity. This is another genuine birdie possibility. The drive needs to be left side of the fairway, avoiding the fairway bunker and dunes on the right. The second shot needs to avoid the out of bounds down the left side along the rail line. The green is large and protected by several bunkers. This par 4 also plays along the rail line so out of bounds runs the length of the left side of the hole. 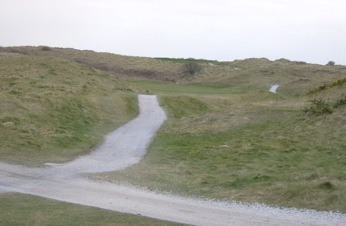 The tee shot is blind, requiring a drive over dunes aimed at a directional marker in the distance. The fairway slopes severely from right to left and narrows as you approach the green as the sea and rail line almost meet. The green is elevated into the dunes. 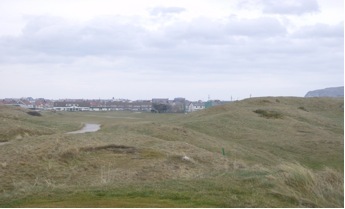 From here on in , the course plays in the larger dunes making it a true links pleasure. 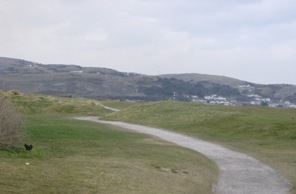 A short par four that plays along the beach with the crosswind blowing from left to right. The green is well bunkered. Playing in same direction along the beach as the ninth, this par 4 has a row of cross bunkers 75 yards short of the green. Avoid the bunkers, the cross wind, and the blind approach to the green and it could be a birdie hole. This third par 4 running parallel to the beach is the longest and most difficult of the three. The hole plays slightly up hill and the green is protected by several bunkers. The hole plays down wind, slightly down hill, and is a slight left to right dogleg. A ditch crosses the fairway about 270 yards off the tee and the green is heavily bunkered. Not for the faint of heart as this hole requires the perfect tee shot, normally playing into the prevailing wind. 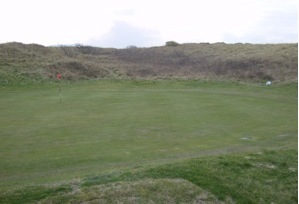 The green is surrounded by large dunes making a chip shot from off the green very awkward. Even with a blind tee shot, this down wind hole playing back to the clubhouse is a birdie opportunity. The fairway is pretty wide so avoid the ditch that crosses it about 225 yards off the tee. The green has several bunkers but most do not come into play with a straight approach shot. 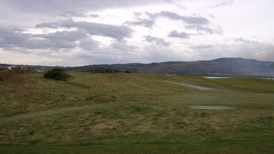 This short par 4 plays up hill and into the prevailing wind. It requires a very accurate tee shot towards the opening in the dunes which is the only approach to the protected green. The green is surrounded by dunes, gorse, and bracken. This short par 3 is the most photographed hole on the course. 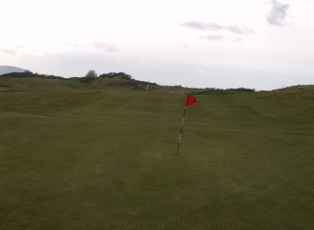 It plays directly into the prevailing wind and is located in the highest dunes on the course. Hit the green and the hole is simple, miss it and pay the price. 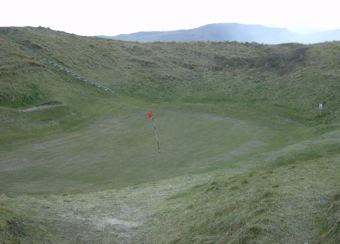 The sister hole to the 16th, this par 3 plays down wind to an elevated green on top of a dune and situated in an amphitheater. The club selection between 16 and 17 can vary as much as 6 clubs depending on the wind. This down wind, downhill hole with a wide fairway offers a good chance to finish with birdie. The green is well bunkered so keep it on the short grass. 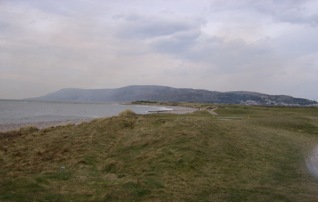 North Wales is a true links course and has the larger dunes, beach front holes, and even railway holes just like many of the more famous courses in Scotland. The course displays the rugged beauty of classics links golf.